Today was one of those days that made me realize how glad I will be to be free of the clinic. Q. had forgotten that I had an intralipid infusion this morning and that he had agreed to be at home with E. So I was under pressure to get home in time for him to get to work so he wouldn’t miss a meeting. Given my intralipid was at 8:30 a.m., I made sure to be at the clinic for 6:50 a.m. so I could be the very first person on the list to see my f/s. That way I could get the ultrasound done, see him, get my meds, and then go over to the IVF suite for the intralipid infusion. It was a great plan…until my doctor didn’t get in before 8:30 a.m. (which is not all that surprising, although it was hugely frustrating). So I did the ultrasound, waited fruitlessly to see him, gave up and got my drugs, went over to the IVF suite, did the intralipid, went back over to the main part of the clinic, and got put back on the top of the pile to see him. And then it took another FORTY minutes for him to turn up and spend three minutes discussing my chart. That meant I had to take a cab home, and I was still ten minutes late, so I don’t know if Q. got up to work in time for the staff meeting. All told I was at that clinic from 6:50 until 11:20 a.m. I will be glad to see the end of that. Good news on the ultrasound front- baby was measuring a week further along than last week (at 8w2d), so s/he is growing well. Heartbeat was still strong (148 bpm). Second sac was still just hanging out. The blood clot was still there and was bigger than last week, but my doctor feels it’s “stabilized” (whatever that means), so he doesn’t seem to be too worried about it. He did tell me to keep minimizing lifting E. until we hit the twelve week mark. He told me to stop the prednisone (which means I’m going to be a lot more tired as I’ve realized this past week that the days where I don’t take prednisone I want to pass out from about 2 p.m. onwards) and to start weaning off the Metformin. I don’t have to go back for two weeks now. It’ll be a relief not to have our lives interrupted, although of course I’ll miss the reassurance that all is well with the baby. We had the same ultrasound tech as last time. She was wonderful- put in the probe, took one look at the screen and then immediately turned to us and said, “I see baby’s heartbeat. Baby is growing. It’s a good baby.” She took a more careful look around, confirmed that the baby was still there and growing and then started taking measurements. Baby measured 7w2d, so still a day behind, but s/he’s grown a week since the last scan which is right on track. The heart was nice and strong – 154 bpm. There was a very noticeable yolk sac- I don’t remember it looking that obvious with E. Maybe it has something to do with where it attaches. Baby was definitely bigger but still pretty blob like. 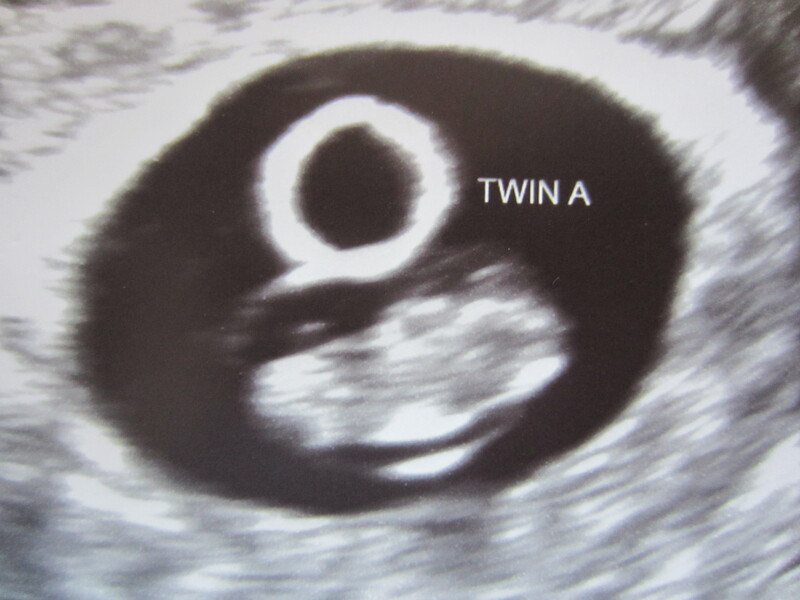 I remember E. being in a ‘peanut’ stage with this ultrasound, but this one still looks more like a blob. The circle is the yolk sac. The blob is the baby. The empty second sac is still there, and so is the blood clot/SCH. The SCH has actually grown significantly since last week (it’s doubled in size if I read my chart correctly). I saw a different doctor today (mine wasn’t in) and she didn’t seem too concerned about things. She told me to stop the Fragmin as of today (HURRAY!) and to now start weaning off the prednisone. I started weaning off the prednisone at this point during E.’s pregnancy but it took a lot longer to stop since I was on a triple dose because of the hives. Everything looked so good she told me not to come back for two weeks. When I said I had to be back in next Thursday for another intralipid infusion she agreed I might as well have another scan at that point too since I’ll be at the clinic. I’m happy with that- I feel sick the morning of an ultrasound, but the reassurance is worth the pre-appointment anxiety. There was certainly no discussion of me taking more time off work. I don’t know if she’s less cautious than my doctor or if he just felt that last week was a really critical one. Regardless, I’m happy to be able to start getting things back into order as I am really behind with teaching prep (to say nothing of the dissertation). When I got home, I had a proper conversation with E. where I told him that I was growing a baby in my body. Q. and I had agreed we’d tell E. if this scan was all right as it’s not fair the way we’re always talking around him, and I know he worries about why I’m always going to the doctor. So we talked about how I’m going to the doctor so much because they’re making sure that everything is ok with the baby, and that I’m not sick myself. E. seemed moderately interested. He said he wanted a baby sister just like in the Berenstain Bears’ New Baby but then was most interested in pointing out how when the baby was born “it would play with baby toys” and wouldn’t be big enough to play with his own toys. I’m not entirely sure he gets it yet, but it’s a start. Pregnancy-wise, I am having much more trouble with food than I was at this point with E., although I suspect partly that’s due to the fact that I’m not on a triple dose of prednisone this time around. I get a lot of low level nausea throughout the day. It’s not serious, but it can be enough to put me off my appetite. I still mostly want to eat salt and potatoes. Dinner is the hardest meal as it seems the nausea gets worse throughout the day. Q. cooked a lovely meal last night and I could barely touch the pork, ignored the salad completely and ate almost all the fries. I also had a completely insane dream two nights ago. Every single part of it was insane, but weirdly I looped back to the first element when I neared the end, so when I woke up it took me that much longer to realize that all of it had been a dream. I found myself lying in bed thinking, “Ok, so the bit where we were all running in the downtown core of a big city while some sci-fi droid things shot at us wasn’t real, and the bit where I signed up for prenatal classes at eight weeks and there were girls there I went to high school with wasn’t real, and the bit with the medieval/dragon boat racing festival wasn’t real, but what about the bit with the mall and my sister’s birthday? Did I actually miss her party because the mall was closing and I couldn’t find the right present?” Eventually I determined none of it had been real, but I felt exhausted that whole day- I think because I’d been so busy in my dreams! With E’s pregnancy I had four betas drawn- the first three were every 48 hours and then the final one was four days after the third. The clinic must be feeling good about this pregnancy as they only made me do two betas before moving me to the final one, which will be tomorrow morning. I’ve had three days now without any documentable proof that the pregnancy is progressing without any problems. That’s proved to be more than enough time to completely freak out on any number of occasions. The worst by far was on Sunday when we woke up to discover that our basement had flooded thanks to the cold snap- a pipe had frozen and then broken when the weather warmed up. I spent about forty minutes helping Q. ferry things up from the basement before I realized I had started cramping. That earned me an automatic trip to the couch for the rest of the day, with orders from Q. to concern myself with nothing more pressing than keeping E. entertained. But when the cramping didn’t subside quickly and in fact only increased in strength the longer I sat there, my mood degenerated. Logically, as I said to my saint of a sister who dropped everything to come over and help Q. carry all the things that were too heavy for me to lift, a pregnancy that could be uprooted by something as simple as carrying a few things up and down stairs was one that wasn’t going to make it. If it hadn’t been that, it would have been something else. Logical, yes, but it didn’t make me feel any better. By evening things had settled down a bit, and I remembered that I freaked out about cramping with E.’s pregnancy too (and probably right around the same point). I’ve been a bit more on an even keel ever since. It’s been stressful, however, to have to ‘out’ myself as pregnant. Not to friends or family- we’re not telling anyone who didn’t already know that we were in the middle of the IVF cycle until we hit twelve weeks (with the exception of our parents- we told them last time at the eight week mark and we might do the same this time if all goes well). No, it’s the medical practitioners. First I had to email my GP’s office to request that they fax a referral letter to my endocrinologist. He requires a referral letter to be sent annually and he won’t let you make a new appointment unless this happens. I should have done this back in early December after I last saw him, but I dropped that ball during the IVF. In the email I had to say that it was a relatively urgent matter because I’d just learned I was pregnant and he would need to see me. Then I had to call my endocrinologist’s office to see if my GP’s office had sent the referral (luckily they had). The receptionist started to book me for May, so I had to interrupt and say I’d just learned I was pregnant. Instead of May I now have an appointment tomorrow morning. And finally my midwives called back to offer me care, and assigned as my primary midwife the woman who was my backup last time and who ended up delivering E. This made me so happy, but it meant another phone call, another appointment to schedule (this one is on the 15th, a week Wednesday). Every time I got a little bit more nervous. I didn’t have a lot of choice in the matter. If you want a midwife in my city, you have to call the second you find out you’re pregnant. And it makes sense to see my endocrinologist as soon as possible so he can raise the dose of my synthroid to make sure everything will be kept under control in the early weeks of the pregnancy. These are good, sensible things to be doing. They are signs of a responsible pregnant person. Nothing bad has happened yet. But it is so very hard not to assume that something will. Those of you who were reading during my pregnancy with E. will remember that I had to switch from the PIO shots to the progesterone pills/suppositories combo after I developed a severe allergic reaction (read: full body hives) at the six week mark. When we resumed PIO shots with the FET this past September, I reminded my f/s of my reaction and he immediately told me I could only use the castor oil vials. I grumbled and grimaced and gritted my teeth all through the PIO shots for that FET, and the PIO shots for the next one. But, no matter what Q. did, they almost always HURT. And sometimes they hurt a lot. Then we started stimming for the IVF, and both Q. and I were taken aback by how easy the stim injections were. The needle didn’t hurt as much! Q. didn’t have to practically force the medication into my body! The first night we started the PIO shots again after the retrieval I pulled out a needle and got it all set up. Q. jabbed me, struggled for a while, and then said he had to pull it out and try again. “I just can’t get it to go in,” he told me. He pulled it out, we changed needles and then he tried again. It took a practically superhuman effort to force the oil in. I dug out my instructions. 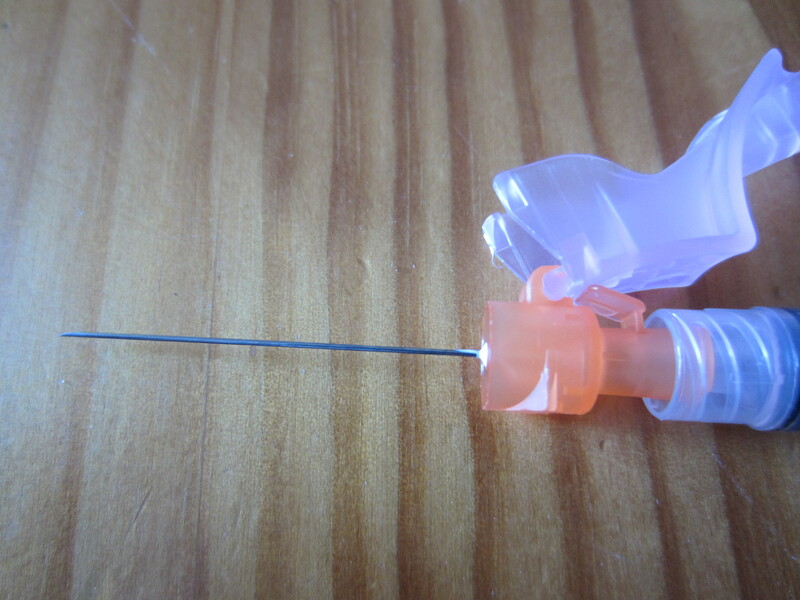 We were using a 25 G needle, the pink and orange one, just like the instructions said. Then I remembered that my other packages of needles (we had a LOT of needles kicking around the house by this stage) were clearly labelled, “Castor Oil Needles”. So I went and got them and discovered that we’re supposed to be using 22 G needles with the castor oil. I got mixed up this time because we had the other type in the house from stimming. The other day curiosity got the better of me and I got out my camera. 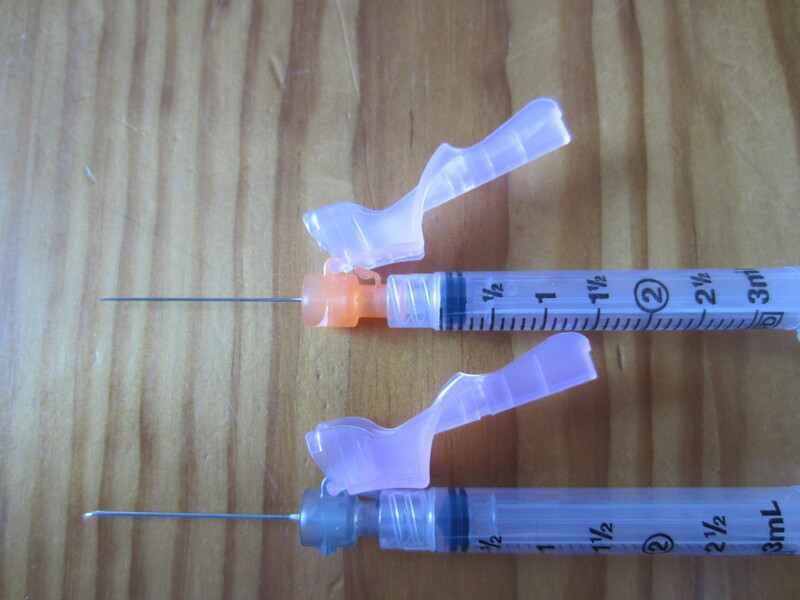 We used the 25 G needles for stimming and for all the PIO shots we did in 2009/2010. 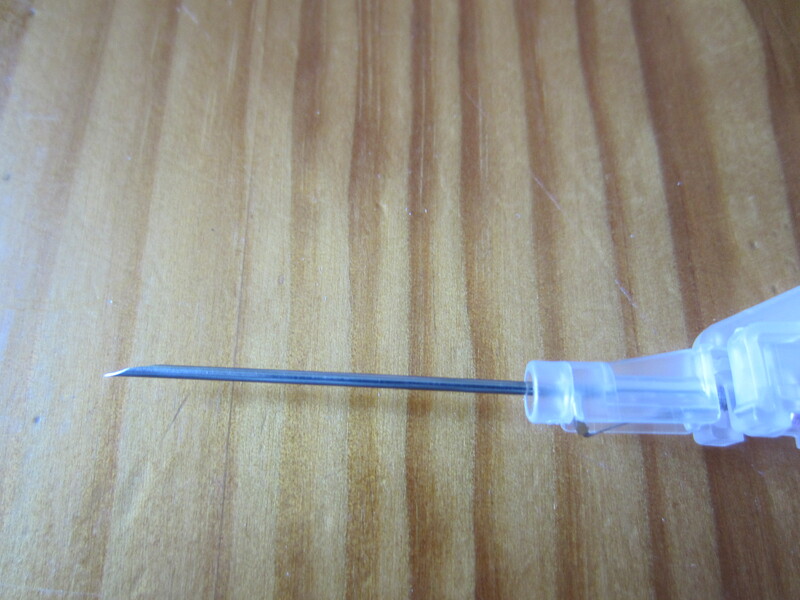 We’ve been using the 22 G needles for all the PIO shots with our 2.0 TTC efforts. 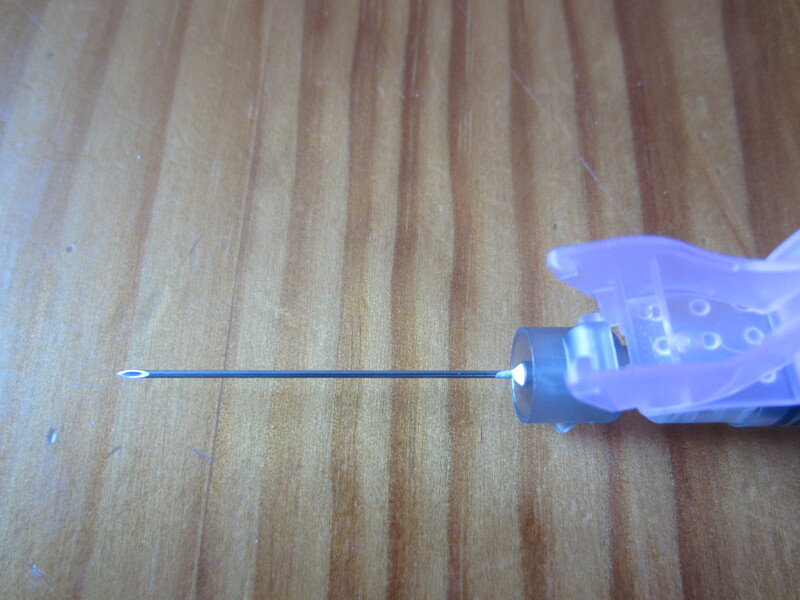 And this is the 25 G needle I would still be using if I hadn’t developed that allergic reaction. And, just to drive the point home, here’s the 25 G (top) and 22 G (bottom) side by side. No wonder it hurts so much this time around! That’s a huge difference! I figured I should post a recap of my retrieval experience, partly in case anyone stumbles across the blog looking for that sort of information, but mostly as a record for myself. On Sunday we weren’t asked to be at the clinic until 11 a.m., but Q. and I went down there quite early so we could stop at a grocery store (as E. had eaten the last of his Che.erios and the WORLD.WOULD.STOP. if there were none for breakfast on Monday) and so we could pop into a store near the clinic so I could do the penultimate look for a particular Bruder dump truck and excavator combination. I have been looking for this for months now. I did find it once before in another branch of the same store (when I had E. in tow), but someone had stolen the excavator. Anyway, given this store is a block away from the clinic, I’ve been going in every time I’ve had to do cycle monitoring to look. They’ve had Bruder logging trucks, and cement mixers, and cranes, and, on Friday, even a fire truck and a tow truck carrying a jeep, but not this set. E. already has the Bruder garbage truck. He loves it. He’s played with it every day for months now. The thing with the Bruder trucks is their size. I don’t want more than two in our house. So even though I knew E. would like the crane, or the fire truck, or the tow truck, I kept refusing to buy them. I was holding out hope that this branch would come through. Sunday I dragged Q. inside. “We just need ten minutes to see if we can find the truck for E.,” I told him. I scanned all the shelves. I’ve learned that stock turns over incredibly quickly in this store (largely because they sell things far more cheaply than anyone else). I pulled out boxes to look behind them. Logging truck. Crane. Fire truck. Cement mixer. Tow truck with jeep. Garbage truck. Giant excavator. “They have a lot of them,” commented Q., looking a bit overwhelmed. I sighed. “There’s one more spot to check,” I told him. I circled back to where, on Friday, I’d found two enormous flatbed trucks with backhoes. They would have been perfect except they were SO big I really didn’t want to bring them into the house. Plus they were a lot more expensive. The two flatbed trucks were still there. But so was one more box- a box with a dump truck and a mini excavator priced at the (ridiculously inexpensive) sum of $35. That was pretty much the highlight of my day. After that we wandered over to the clinic, where all the nurses in the IVF suite commented on our giant truck. Q. went off to do his thing, one of the nurses came in to take my blood pressure and get my IV hooked up (she wasn’t at all pleased at what the IV for the intralipid infusion had done to my right arm), and then we just chilled out for an hour or so. I think it was around 12:30/12:45 when my f/s turned up (the retrieval was scheduled for noon but he is always, always late), and they called my name first. I went to the ‘loo (massively awkward with an IV attached) and then we headed into the OR. The nurse walked me through what would happen, and then she started up the drugs. I remember that my legs suddenly got really heavy and that I was feeling a bit dizzy. Then my f/s came in, started getting ready, realized I was still feeling more than he would like, and ordered more drugs. That’s the last thing I remember until I was back in my cubicle. Q. says I actually fell asleep during the retrieval, which is a new one for me, and not really something they wanted to have happen, so he and the nurses kept having to remind me to “take deep breaths, Turia!”. Q. was sent off to buy the Dostinex to guard against OHSS. Apparently I had a lengthy conversation with one of the head nurses about taking this pre-emptive measure. I don’t remember this at all. We stayed in the cubicle until 2:30 or so, when the nurse came to take out the IV, and I told Q. I felt well enough to go home. We went downstairs and hailed a cab. Arriving home we learned that E. had refused to take a nap, but he seemed to be in good spirits and had absolutely loved spending the day with his Auntie C. He’d made a snow globe, and a bunch of vehicles out of bits and pieces from the recycling, and had read stories, and had a blast. Q. snuck the giant truck upstairs, and I crawled onto the couch and stayed there for the rest of the afternoon/evening. I am so so so glad Auntie C. is staying with us for this week, as it was a life saver to have her able to entertain E. That meant Q. could keep an eye on me, and make dinner, without E. getting riotous or stroppy. At one point Q. and Auntie C. forcibly bundled E. (who was protesting mightily) into his snow gear so he could go play in the 20-odd centimetres of snow that had fallen over the last day. Once he was outside, as predicted, they all had a marvellous time. Once I got onto the couch, I felt well enough to eat, so I ate some white bread, and then a whole wheat roll. Then, when I still felt ok, I ate some pretzels and some rice crackers. When they seemed to settle well enough (I was still completely starving by this point, having eaten nothing since 9 p.m. the night before), I ate some of my sister’s granola. I think that was the straw that broke the camel’s back, as shortly thereafter I realized I had better go hang out in the ‘loo for a while, and sure enough I puked my guts out. For supper I drank around a third of a mug of miso soup and then ate some french fries. That stayed down, and by the late evening I was feeling much much better, although I was still very sore and uncomfortable. I went to bed early, around 9 p.m. Poor Q. had to come up to give me the first PIO injection and he had a terrible time with it. I realized this morning that we were using a 25 gauge needle, which is what they tell you to use on the instructions, but if you’re using castor oil, which is even thicker, you have to use a 22 gauge needle. No wonder he was struggling so much to get it in! Monday I felt much more human. Still sore and still massively bloated, but no longer nauseous. I felt well enough to go do my duty day at E’s nursery school, and then went and got (another) poutine for lunch. It is perhaps the one good thing from this whole mess- being under doctor’s orders to eat terribly. Now it’s a waiting game. I don’t know what their cut off for blastocysts is. I’m not going to lie. I’m disappointed. Yesterday they retrieved 25 eggs. Of those 25, 12 were mature enough to be ICSI’ed. Of those 12, 10 fertilized. Obviously it is a great ratio of mature eggs to fertilized ones, but I am gutted that so many of my eggs were immature. I’ve felt all the way through this cycle that I was stimming too quickly- so much more quickly than the cycle that produced E. Now I wonder if I was right. I don’t know if we’re going to be able to go to blastocyst with ten embryos. They’re going to call me tomorrow to tell me whether or not I should be on standby, but the final decision won’t be made by my f/s until Wednesday morning, so I could literally have only a couple of hours notice. I want to go to blastocyst because that’s what worked with E., but at the same time, I am so worried that if we do go to blast, I’ll have the same terrible attrition rate that we did in 2010. If 17 embryos produced only 4 blasts, what if 10 only produce two? What if we have nothing to freeze and this becomes an ‘all or nothing’ transfer? I’m not ready to have my hopes of making E. a big brother extinguished. I was counting on having something to freeze so we could revisit the whole issue next summer/fall if we had to. I am holding on to my doctor’s assurances that they have massively improved their technology with regards to embryos and embryo survival between days three and five. I am holding on to the hope that maybe the embryoscope will help support a couple more who might have struggled in the regular incubator, that our decision to use it might make a difference. I know, I KNOW that it only takes one. I just wish we were starting with a better hand.